Live Creating Yourself. : Bar Cart Sale on Joss and Main! Hey all! 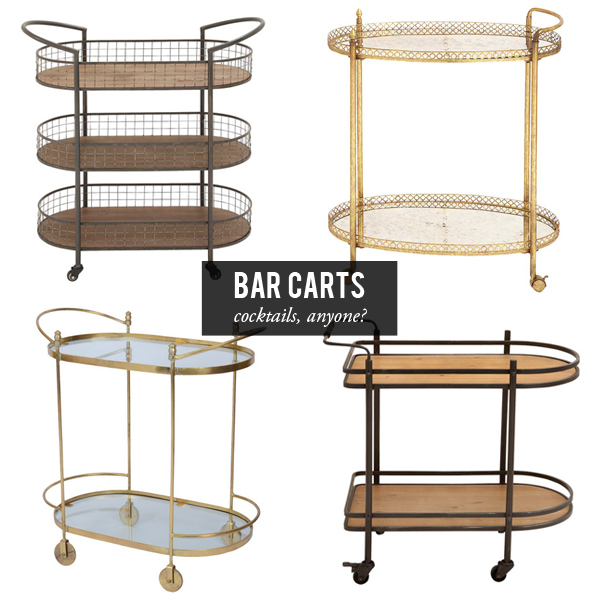 Signing on to share the good news that Joss and Main has a terrific bar cart sale going on right now–it's under the "Toast to Festive Style" sale. If I didn't already have one I loved from Society Social, I'd definitely be snatching up one of these beauties just in time for holiday entertaining and buckets of spiked cider. I'd probably choose the top right brass style for $178. Which one is your favorite? ooh! I love the one on the bottom left! very art deco!